Taking a break from the 25th until the 7th! Happy Holidays! Home Announcements Taking a break from the 25th until the 7th. Happy Holidays! Taking a break from the 25th until the 7th. Happy Holidays! This is our 2nd official Holiday season as Street Hunters and we are very excited with the way things are evolving! So, we would like to take this opportunity to say a special thank you to all of you for being here, supporting us, understanding us and pushing us to keep on going. Sometimes it is tough, but we persist and here we are only months away from our second birthday! How exciting! All thanks to you! As you know, StreetHunters.net is a passion of ours. It is a way for us to express how much we love Street Photography. Through our growing community we aim to spread the gospel of the art as much as possible. 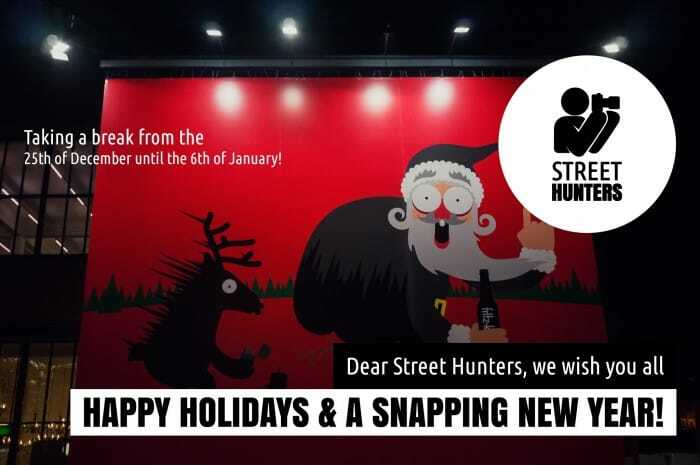 We want you to tell your friends about Street Photography, help them try it, talk to them about Street Hunters and all the other awesome Street Photography resources out there on the web. We would like to see the overall Street Photography Community to grow. The Holiday season is a time for us all to be with our families and our friends. It is a time for having an extra glass of wine. It is a time to hit a Christmas party, to unwind. It is a time to just have fun, forget about the everyday routine and feel the joy of the festive days! That is why Andrew and myself have decide to take a break from the website for a couple of weeks. We will stop posting on the 25th of December and resume posting on the 7th of January. We will be sharing photos and commenting on the SHRC and the other Social Networks, we will just not be producing original content during our break. Stay tuned for 2 more days of posts! Tomorrow we will post the Weekly Street Hunter Photo and on Wednesday we have a guest blog post to share with you written by one of the biggest names in contemporary Street Photography, so stay tuned! Anyway, this was not meant to be a long post and I don’t want to bore you. The main thing this post is about is to thank you and wish to you all Happy Holidays and a Smashing New Year! Inside Gregory Tselepidis' Camera Bag!